Complete the form below to have one of our professionals contact you. "PRESTIGE brings a sense of HONESTY & PRIDE in Workmanship that is rare in today's market. They are one of the most RESPONSIVE & PROFESSIONAL TEAM I have ever worked with." "PRESTIGE demonstrates a HIGH LEVEL OF COMMITMENT, is very RESPONSIVE TO OUR NEEDS, maintains great COMMUNICATION, and provided EXPERT GUIDANCE on a variety of landscape, irrigation, & maintenance issues." "PRESTIGE'S ability to complete work while our school was in session in a SAFE & PROFESSIONAL manner was a very important aspect of their job during our growing process. 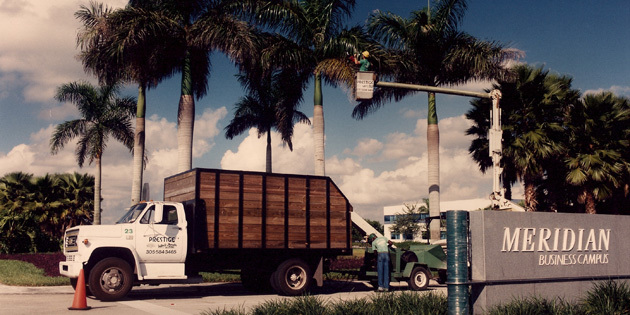 They were always Very DEPENDABLE & TIMELY in providing Landscaping, Irrigation, Mulch & Maintenance services in a project that had many difficulties." Our experienced team of horticulturalists at Prestige can create and maintain a distinctive outdoor environment that will enhance the value and curb appeal of your property. From Start to finish, Prestige provides complete project management, designed to address the unique needs of its' clients. 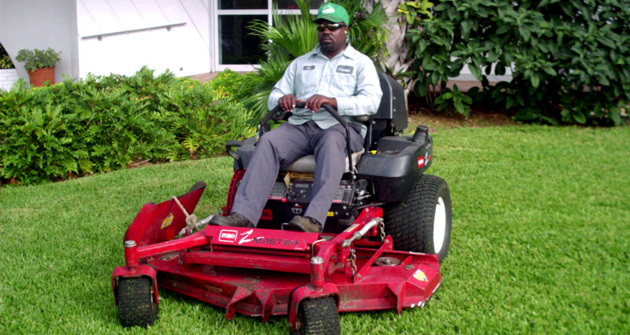 This personalized care along with our Full Service Packages developed especially to fit your budget, has made Prestige one of the most respected grounds maintenance & landscaping companies in South Florida. what Prestige can do for you. Prestige Property Maintenance has been providing quality Grounds and Lawn Care in South Florida for over 20 years at competitive prices. We have retained contracts from the beginning and continue to grow each year adding new multifamily residential, commercial, industrial, and municipal clients. At Prestige Property Maintenance we will work with you to review all aspects of your landscape investment, identifying potential problems and proposing solutions. We consider not only how to improve your property, but how to control costs as well while ensuring that your investment is well protected. Let us build an advantage for your property or business by enhancing the value of your property thru your landscape. Prestige Property Maintenance's team of Specialists will advise you on the latest advances in turf and plant management and make sure that your property maintenance plan is up-to-date with the latest in fertilization technologies. 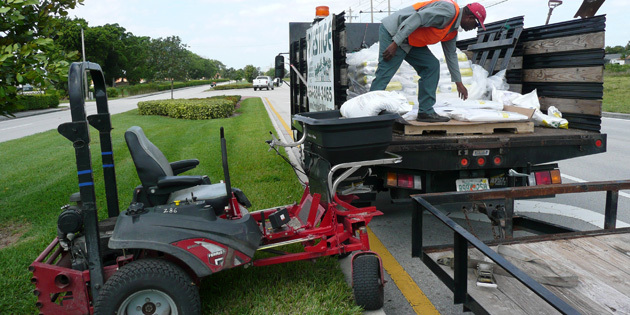 All this is used to promote optimum health for your lawn and grounds in our ever changing South Florida environment. Each schedule is developed uniquely for your properties requirements and with your budget in mind. Call us Today for your Free Property Analysis by one of our Experts. 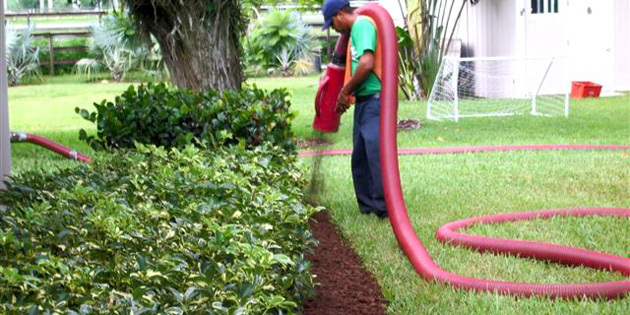 Our weed control team is focused on providing customers with the safest and most cost effective weed control services. We use the latest technology and chemicals to ensure the best results that are both environmentally friendly and cost effective. All our technicians are fully trained and licensed. Prestige has the experience to implement either regimented pest control or Integrated Pest Management (IPM). IPM is a combination of environmentally compatible and economically feasible management methods, which reduce pest populations to, or maintain them at tolerable levels. The primary keys to successful IPM are familiarity with pests' life cycles, correct diagnosis, and monitoring. When problems do occur, Prestige Property Maintenance follows a sequence of steps that is designed to minimize impacts on the environment. Effective IPM determines whether a pesticide applicatoin is necessary or whether the pest can be managed by other means. Often, non-toxic, natural pesticides can be used to control insects, which is preferable in areas where children or pets frequent. The prevention of economic or aesthetic damage to the plant while avoiding adverse effects on humans, wildlife, and the environment is the goal. Florida law requires that State Certified Pest Control Operators supervise all applications. Prestige Property Maintenance is qualified and complies to all Federal, State and local standards. With recent drought conditions in South Florida still fresh in everyone's mind, water conservation has become one of the most important issues for those living in Broward, Dade and Palm Beach counties. Increasing demands will be placed on all irrigation systems to deliver water more efficiently. We are a full service irrigation company who can engineer practical, economical and effective irrigation solutions. 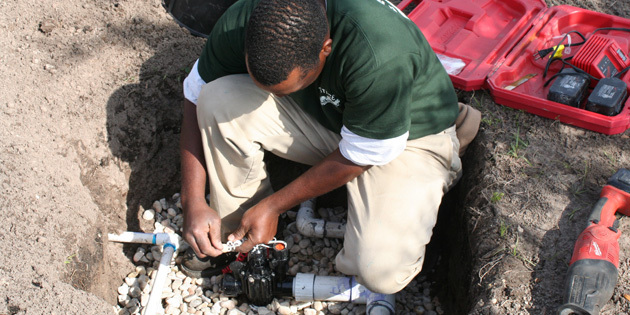 Our irrigation specialists are trained in the latest irrigation technologies. We have the expertise to design, troubleshoot, repair, and effectively maintain any type of system. Prestige Property Maintenance has over 20 years of practical experience along with engineering and management qualifications, which ensures you get the best possible result from your irrigation project. 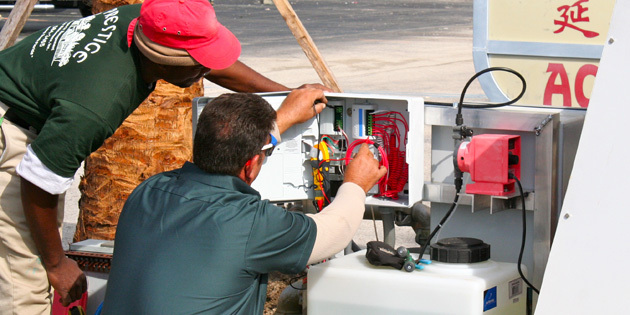 We can maintain, troubleshoot, and design all types of irrigation systems for multi-family residential, commercial, industrial, and municipal properties, we do it all, on time and on budget. Contact Fred (our State licensed Irrigation Contractor), at (954) 584-3465 or by e-mail for more information. Prestige Property Maintenance specializes in offering a full range of landscaping services from complete new installations to the renovation of existing landscaping for multi-family residential, commercial, industrial, and municipal properties. Prestige has developed a distinct advantage in this arena because we have our own 25 acre Plant and Tree Farm. 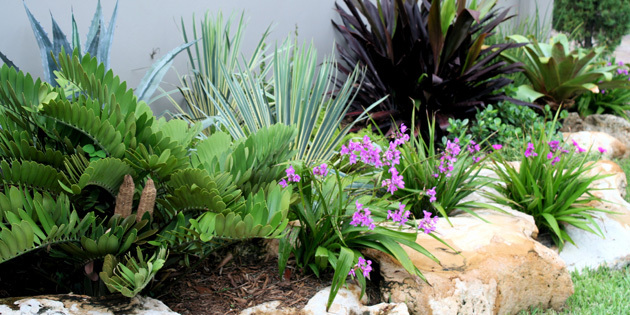 We will work with you and suggest the latest and best plants and trees for our South Florida environment and easily accommodate you on any unusual and special choices. Another advantage of operating our own farm besides being very competitive is our knowledge of any particular problems with a plant or tree you have chosen or that was specified for your project. We will steer clear of these choices and recommend some comparable substitutes. The most important information that will be reviewed is how the addition of this landscaping or trees and plants will affect your maintenance budget. "Visit our Farm today and let us Design and Quote your Project"
A unique feature of our landscape design service is that, you, the customer can visit our 25 acre nursery and hand pick what you want to use in your landscape. You can choose from a wide selection of native and tropical trees and plants. Prestige Growers is also the EXCLUSIVE DEALER of URDL'S Boulders, Waterfalls, Stepping Stones, and Rock Borders & Walls in Broward County. URDL's is one of the pioneers of the precast rock and stone industry in South Florida with some of the most natural looking products available. Prestige's full line of Heavy Equipment; Dozer, Loader, Backhoe, HighLift, Skid Steers, and Barko, can be invaluable when our clients need any Clearing or Site Work. We work closely with the customer, ensuring that their requirements are met within their budget and on-time. Customer service is our number one priority. The addition of seasonal flowers to a landscape adds color and variety to a property. It allows you to totally change the look and feel of the environment. Up until now, the planting of annuals and seasonal flowers was costly. With every change, the entire top layer of soil had to be removed because of the nematode problem which is prevalent in South Florida. On large beds, this required heavy equipment, and truck loads of soil. In many cases, condo owners and property managers opted for less expensive alternatives to stay within their maintenance budgets and compromised the quality of their plantings. Prestige Maintenance keeps up to date with the new developments in the understanding of soil biology. They bring this new technology to you. It is now possible to inoculate the soil with specific beneficial microbial populations. The benefit to you is that the soil no longer has to be replaced with each new planting. This means that you can have seasonal changes more economically than ever before. Seasonal flowers are grown in our own 25 acre nursery. This ensures that they are healthy and meet your specifications. As a major part of most maintenance contracts, well manicured hedges add a polished finish to a property. Hand pruning is done when and where necessary to promote growth and health. Prestige Property Maintenance ensures that all shrubs and hedges will be kept at a uniform height, and will be trimmed in accordance to a pre negotiated schedule. Our personnel are trained to trim to suit your properties landscape theme, whether it be formal, natural or custom. At Prestige Property Maintenance, we understand local environmental conditions and comply with municipal codes and arborists standards to effectively care for your trees. Tom Jacob, our on-staff certified arborist, ensures that all our customers tree care is completed in a professional manner. Prestige Property Maintenance is qualified, insured and licensed to take care of your tree trimming requirements. Be sure anyone you hire to perform tree work is properly Licensed and Insured! Dead limbs, trees, and overgrown plants on your property are not only an eyesore but a potential danger during tropical storms and hurricanes. Overgrown or unbalanced trees are not able to withstand windstorms. Let us address these issues on your property before there is even more loss or damage to the property or any tenants, guests, or owners are injured. Attractive Appearance-provides an instant, neat uniform look to your landscaping. This is probably the single best service you can take advantage of to give your property that fresh neat look. Moisture Retention-reduces the speed of water evaporation while keeping an even level of water on the upper levels of the soil. This is also very critical in these times of water restrictions and conservation. Tree and Plant Health-one of the leading causes of plant disease and death is weed-eater damage, by keeping defined beds and tree rings this problem is greatly reduced. Weed Control-mulched beds and tree rings will drastically reduce the germination and growth of weeds between servicing and spraying the beds. Temperature Control-mulch insulates plants and trees from drastic temperature changes. This is especially helpful with the extreme heat we have in South Florida. Cost Savings-bagged mulch usually costs about $45 per yard to install, while having your mulch blown in will run about 30% less without having all the liability of having all those workers on your property installing bagged mulch. The savings is even greater if your full time maintenance men do the mulching on your property. If you add up all the man hours spent mulching per year you may be able to reduce your staff hours along with some of your headaches. We install all varieties and grades of landscape and playground mulch. For more info on how Prestige can Save you Time and Money on the application of mulch over large areas, give us a call today and have your estimate tomorrow. Organic used to mean composted manure applications to provide the necessary biological activity in the soil. Today, with the advances in soil management, these beneficial bacteria and fungi are available in scientifically formulated, highly effective, easy to use products. Prestige Property Maintenance is up-to-date with the new advances in Organic technology. Using the latest methods in soil biology, Prestige can bring these new advances to you. With Prestige's expertise, switching to organic is now becomming an economically viable option for multi-family residential, commercial, industrial and municipal grounds. There are a number of environmentally friendly alternatives to safely control insect populations. Prestige's team of experts can take you through the various alternatives, finding cost efficient solutions to your problems. Prestige Property Maintenance's team of experts are equipped to handle the bioremediation of land, landfill, or wetland areas. Specifically suited to the restoration of parklands, industrial, commercial, and municipal sites, we restore the environment to an ecologically balanced area. Our system is tailored for remediation success, finding solutions to environmental problems such as treating soil contaminated with hydrocarbons, gasoline, oil, hydraulic fluid and pesticide spills. We can now prevent these spills from creating a hazard to the turf or to irrigation ponds. Prestige can treat water with excessive waste, phosphates, algae, anaerobic bacteria, certain weeds or excess nitrogen, returning it to a clean, natural state. Remediation is achieved by using a combination of microbial products that remove hydrocarbon spills, biodegrade organic pollutants and then, by adding microbial supplements and biostimulants, promote natural soil or water conditions. This process enhances the viability of all plantings, minimizes transplant shock, encourages germination and regrowth to the treated areas. Copyright ©2010 Prestige Property Management and Maintenance, Inc. | Marketing by Higher Images, Inc.